While his training and artistry encompassed all aspects of the visual arts, it is in the realm of color that Henry Hensche made significant contributions - both as an artist and a teacher. One could even say that his artistry sprang from the careful analysis of nature’s color and light that was at the heart of his instruction. The name Charles Hawthorne was forever on Hensche’s lips, even to his last days as a teacher at the Cape School in the late 1980s, in Provincetown MA. Hawthorne, who had been Hensche’s teacher, hit upon a method of teaching color perception that centered around paintings done on Upson board with putty knives - known as “mud heads”. A model, often one of the local Portuguese fisherman’s children, posed on the beach, sitting on a barrel with their back to the sun. The students positioned their easels facing the shadow side of the model. Hawthorne instructed them to paint this dramatic silhouette against the blaze of light on the beach, the water, and emanating from the sky. 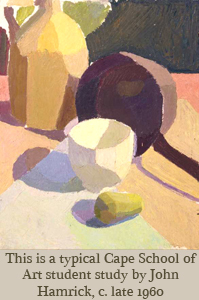 By having his students paint with a large, unwieldy putty knife, it forced them to concentrate on the large shapes of color, rather than outlines around the shapes, the way one might do when painting with a brush. The quality of a study was judged by the effectiveness with which the light was suggested by these simple shapes of color. The resulting mud-like color of the face in shadow gave rise to the studies' nickname, "mud head".
. As Hensche continued to teach in Provincetown after Hawthorne‘s passing, he brought his own ideas of instruction to “the art of seeing and painting”. 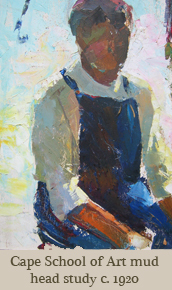 To facilitate color mixing, he had his students work with painting knives, instead of the cumbersome putty knives. He further simplified the "mud head" concept by having the beginning students paint colored blocks in sunlight. This gave t he student greater freedom to concentrate on the study of color unimpeded by drawing issues related to portraiture and the figure. Perhaps the most significant development in Hensche’s instruction was his refinement of these large simple shapes of color (the “main masses”) into further subdivisions, or “major variations”. These variations are then broken down into smaller subdivisions called “minor variations”. In this way forms are modeled with color changes, within a given “light key”. The term “light key” refers to the quality of the light illuminating the subject - whether the subject is seen on a cloudy day vs. a sunny day, indoor vs. outdoors, early morning vs. late afternoon light, and all points in between. Hensche was fond of quoting Cezanne’s famous dictum that “every form change is a color change”. He followed this approach in his own work with almost a religious zeal for the 70-odd years of his painting life. One can see by the many paintings on this website that his devoted analysis of nature’s light yielded spectacular artistic portrayals of light, merely hinted at in Hawthorne’s best color work.